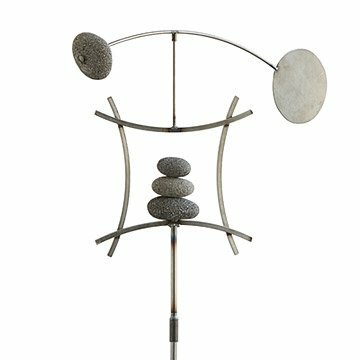 Add an element of zen to your back yard this well-balanced, dynamic piece. He preferred to go with the flow, even under the stormiest conditions. With an emphasis on balance, this Asian-inspired, kinetic wind sculpture--the upper "arch" of which rotates--remains relaxed and stable, even in gusty weather. Made of steel, the piece will acquire a lovely rusty patina when exposed to outdoor elements. Wherever the wind happens to take it. Made by Justin Kelchak in Bend, Oregon. Justin Kelchak discovered his passion for creating metal art in 2003 when he began working for a local bronze art casting foundry. His passion and creativity quickly advanced him to the shop foreman position, which gave him the opportunity to personally build small intricate sculptures to massive 30 foot monuments for many world famous Artists such as Lorenzo Ghiglieri, Lawrence Stoller and Barry Stein. Weekends spent camping, hiking and exploring the many amazing waterfalls in Oregon instilled a desire to bring the beauty of nature indoors. When he began designing and building custom fountains and home decor in 2005, it quickly became obvious that he found his niche. He now creates a wide variety of art such as wall sculptures, tabletop sculptures, mood lighting, candle holders and wine racks. If left to oxidize naturally over time, the surface will eventually develop a pleasant rusty patina. To help retain the existing finish, apply a clear, exterior-grade, polyurethane sealant once a year. I love this sculpture, and it was easy to put in the ground. There is a problem that I don't know how to solve: the 3 stones that are to be placed on the center spike won't fit the spike. The holes bored in them are too small! Help! I like that it is made from natural materials with a clean design. The cairn is lovely. I had to drill the holes a bit to make them fit on their rod, but now they look great. I just love it but wonder how I can keep it from rusting. We live on the Gulf of Mexico so that definitely will rust it and I like the steel/industrial look of it. Sad that it wasn't delivered in time for Christmas when it had been promised. While I love the design, I was not expecting this to rust the day after I placed it in my garden. I hardly thuink rust is a patine and was very disappointed. I was also sorry that the rocks are not more substantial. That said, it is a nice piece that moves elegantly with a strong wind. My expectations were probably too high for the affordable price of this work. This is a piece of artwork! Very well crafted....more than I expected! Thank you! This is in our yard by a flower garden. We love to watch it in the wind.